Sometimes a site just wants to get your attention by posting a slew of deals at a price we can all afford. Take eBay, for instance. Right now they are having a big sale on assorted goods for $50 or less. To add some incentive they are tossing in FREE shipping too. 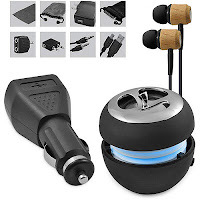 My favorite is the Ematic 11-in-1 accessory kit with wood earbuds and portable speaker for iPods and MP3 for $15 (50% OFF). That's a mouthful right there, and for less than two big burritos at Chipotle. It's not just electronics they're peddling this time (those are there in force, however) - it's the kitchen sink. No, not literally, but I did do a search and those are for sale on their site. Clothing, jewelry, golf clubs, watches, sunglasses, vitamins, perfume, and a jumbalaya of other deals are included. I mean, where else can you get t-shirts and a high-tech mouse trap on the same sale page? Click here to view the list of deals at eBay.